QuiteFine HW - Fancy Young Mare with Super Lofty Gaits! 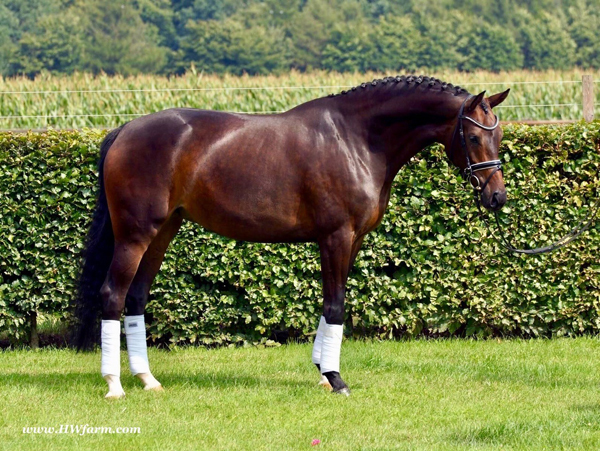 QuiteFine HW, is by the sensational stallion Quotenkönig, Vice Bundeschampion 2012, Westphalian Champion 2013 and 2014. BundesChampionat 2015, 4th place, WorldChampionship 2015, 8th place in the final round, victories in 3rd and 4th levels, by BundesChampion Quaterback - Fürst Piccolo - Sandro Hit - Contender, who was just licensed for Hanoverian and Oldenburg in Germany. Quotenkönig was our top pick as a foal, purchased and raised in our German barn, still owned and promoted by us. A top producer with consistent show success, competing against other licensed stallions in big competitions, he shines every time out, no doubt! This exceptional moving young stallion has already started his winning ways. Paired with the talented young rider, Christian Flamm of Hessen, Quaterback galloped away from the competition at the Bundeschampionate in 2006. Quotenkönig’s dam is “St.Pr.St. Fleet-Street“, 1. Reserve-Champion (Elite) of the mare performance testing in the year 2006 and she participated at the Bundeschampionat as well. She scored an amazing 8.99 at her performance testing. Quotenkönig (King of hearts!) is a picture perfect and absolutely stunning young stallion. He was the favorite of the NRW stallion licensing auditions, 2011. Superb gentleman with 3 above average gaits. He impressed everybody with his cat like movement, super free shoulder and unbelievable active hind end. He is one of a kind in movement, dynamic, charm and esprit. He was the reserve winner of the licensing. His pedigree as well as his 100% super character and temperament as well as his exceptional movement will let hope for outstanding offspring. All of these phenomenal genes, leading to no other result, as Quotenkönig to be one of the top stallions these days. He also won the Bundeschampion Qualification in Coesfeld-Lette, 5yo horses, with Lisa Neukäter in the saddle and a score of 8,4 and followed up with the victory for Westphalian Champion in 2014! QuiteFine HW's dam is by the unforgotten Donnerhall son Donnerschlag, by (Donnerhall / Pik Koenig). For many years the main sire at St. Ludwig, Donnerschlag left his distinctive mark on an era of breeding at the respected stud. His career had many high points,". . . enough to fill a book." At his 1990 stallion performance test, he showed a multitude of talents. In 1993 he was winner of a finals class at the Federal Championship for dressage horses, at Manheim. Donnerschlag posted many wins and placings at Grand Prix and World Cup , Intermediare level. His sire, Donnerhall was a stallion of legendary proportions, who achieved the unbelievable sire production index for dressage of 274 points! His dam, Pirola was a full sister to Pik Bube I and II. Bred to Raphael she bred the stallion Regazzo, now in Sweden. Her dam line is based on international jumper Dohlenfürsten. As a sire Donnerschlag has excelled--he has over two dozen offspring competing in "S" dressage, and a large number of gold medal and high-priced auction foals. He also has a large number of approved sons, including Dream of Heidelberg I and II, Donnerwind, and many more. His son Fontainbleu is a dressage champion in France. Donnerschlag's daughter Dona won the Rheinland elite mare show in 1998, and Donna Doria the Oldenburg elite mare show and the state riding championship. QuiteFine HW is a super fancy, uncomplicated, sweet and willing girl. Quotenkönig's offspring are highly sought after and highly praised for their ride ability and willingness to learn and please. QuiteFine HW has super lofty gaits with quite a lot of airtime and is already super balanced and uphill herself, doing amazingly well under saddle. With these bloodlines (Q, D and F lines! 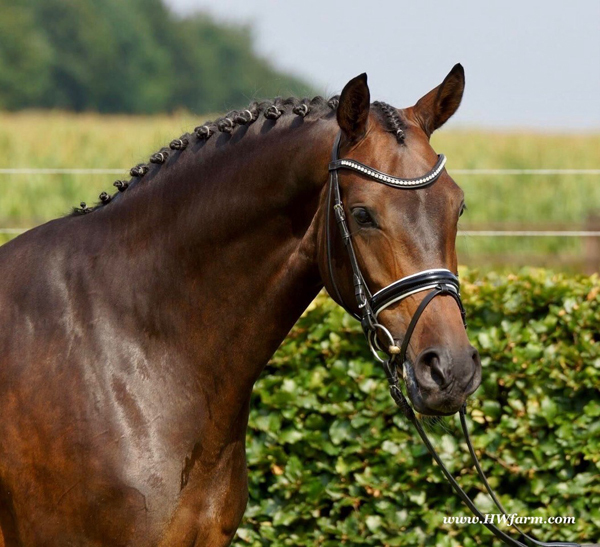 ), she will be a priceless addition as a broodmare to a breeder with outstanding taste, or she will happily compete against others in the dressage ring. 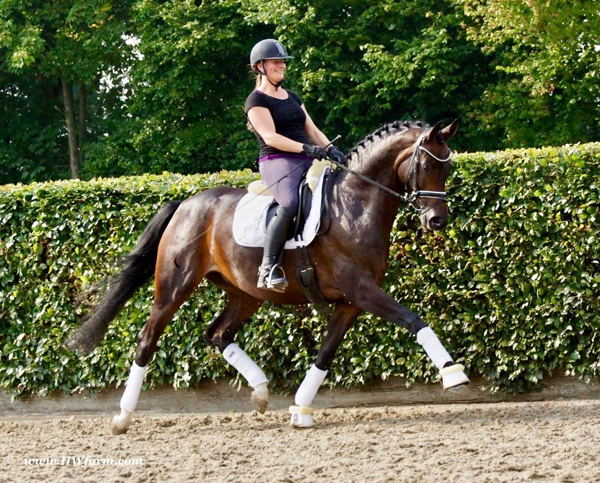 With this mare, you can breed wonderful offspring by embryo transfer now or later after a dressage carrier. Barley ever can you see such a young horse moving like this one, cat like, elastic, powerful girl, energetic, with a strong hind leg and stunningly free shoulder. QuiteFine HW is forward thinking, in daily training and improves quite fast, already working solid at 2nd level, this horse shines and is pure fun for the rider. This girl quite clearly shows talent to piaffe and passage easily, is sweet in the barn as well as easy to manage. 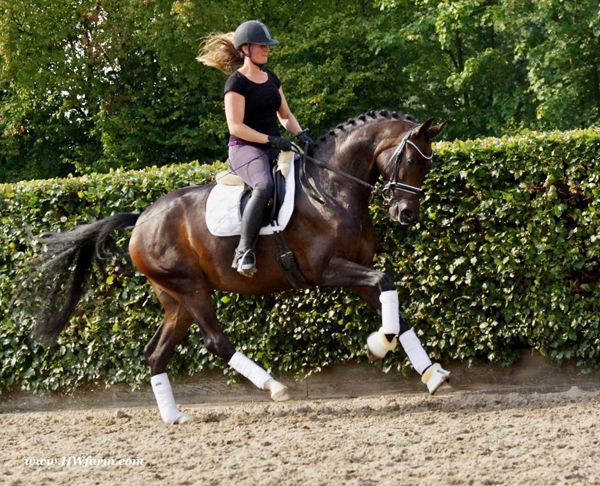 She will suit a professional, an adult amateur or Young Rider just the same. QuiteFine HW is a super nice mare to go up the levels and show all the way to the top. With her conformation and gaits, she should be able to go Grand Prix and international classes and she will impress the judges and the audience alike. Clinics will be a blast with her and to show off her gaits will be fun every time out. She stands still for the farrier and is waiting for her new partner/rider for life to get to know her, train her and to spoil her rotten. She is a wonderful example of what you can accomplish with the perfect match of bloodlines: Horses that can move! Easy in the barn, loves to cuddle, stands for the farrier, goes in the hot walker, solarium and for sure is searching those cookies in your pockets. Here is the best of both worlds, ride or breed - or do both, depending on your preferences. $ 90,000 - Including import and quarantine to NY, check out her video clip!! !